I know many of you out there agree with the above statement. And I know that getting your hands on a whopper of a novel (or nonfiction book if you like that kind of thing) can be kind of exciting and a challenge. However, I find myself getting intimidated by books more than 500 pages long. Right now I'm about halfway through The Name of the Wind by Patrick Rothfuss. I'm enjoying it very much, but I'm pretty sure one of the reasons it's taken me so long to get here is its 700-something page length. I don't know about you, but I like the thought of not tying myself to one book for too long. When I do pick up a lengthy volume, I end up setting it aside for a while to read another book in between. And actually, now that I'm thinking about it, I did that with Wildwood by Colin Meloy like two weeks ago. Maybe it's just the visual. I find I don't mind it as much when I'm reading a huge book on my nook, probably because it doesn't feel ungainly in my hands and I can't see how little progress I've actually made. This might also be the reason I haven't been finishing many books lately. I'm the same way! Big books are so amazing and yet so intimidating. I started reading the Game of Thrones books and I think reading two of them set me back quite a bit in in my reading schedule since I'm hopefully trying to meet my goodreads reading challenge goal. Now that school's out I'm trying to take advantage of the extra time and sort of staying away from huge books right now! I don't really like them because I can't lie in bed comfortably with a massive book. It's not too bad if you're actually enjoying the book, but if you're having to slog through something you're hating (I can't not finish a book), it's torture. one of the reasons I like big books is so when it is done and it is sitting on my shelf and people gawk and say you read that whole thing?! I feel just a little bit smarter.. Also books that big you cant help but be more invested in the characters. I love Rothfuss. If you like historical fiction try Rutherford - them's big books. I like big books, but I agree that I often find myself putting them aside to read something else and then going back to them. I'm currently reading The River of No Return by Bee Ridgway, which clocks in at close to 600 pages. 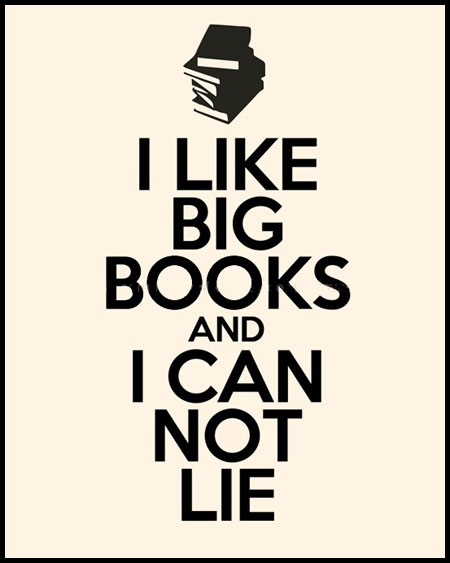 And the other thing with big books, like Patty said above, is that you can't lie in bed comfortably and read them! Have you ever read Taiko or Musashi? I am so trying hard to finish those monster this year ;^; yes yes, big books are intimidating. I've found huge books to be less intimidating on my Kindle bc, as you indicated, they're not so heavy in my hand. I don't usually pay attention to length. In fact, i sometimes worry more that short books haven't fully fleshed out their story. Although I have to admit the 1000+ pages of Les Miseerables are keeping me from starting that! I don't mind big books. I just recently read a book with 500+ pages in pretty much a week. There is an easy trick to keep track of your progress: just put a bookmark in it and watch it wander through the pages. If the content is uninteresting a book of any lenght can get annoying. I find I sometimes do put off picking up a chunkster of a read but once I do I typically don't have any issue with the amount of time it takes to read it. I think generally because I already expect it to be pretty time consuming and then usually am able to finish them more quickly than I'd expected. My biggest issue tends to be with really dense, shorter reads. The ones you don't anticipate taking up as much time as they really do. Those hang me up in the worst way. I find that I want to read so many different things that I keep my page count average around 300. I also tend to avoid series. While a long book can be great I've never been the person who wants to keep reading about the same characters forever. This is all probably because I'm a slow reader. Regardless, a long book has to convince me of its greatness before I purchase. I recently got Game of Throne because of many recommendations and stoped reading after the prologue to get in fun short The Boyfriend List by E Lockhart. Good luck with your shelf cloggers! I do the same thing! It's obnoxious, because I know I'm a fast reader and where it would take most people I know much longer to read the same book, it frustrates me because I can't finish it as quickly as the others. It's just such a great feeling to finish a book that I get discouraged when it takes twice as long for me to read it. This is especially annoying now that I am working a full-time job and I have even less time to read. That makes the book feel like it will never end, and as much as I love immersing myself in the story, I want to reach the conclusion eventually as well! 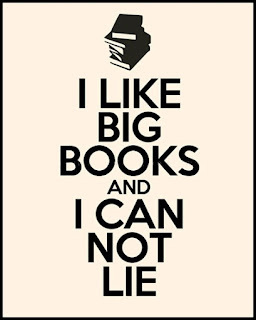 I tend to do what you do - I'll read other shorter books in between a really big book. The only book I read in less than a week that was large was Harry Potter and the Order of the Phoenix, but I just can't seem to do that anymore. My time is limited and, if I want to be honest with myself, so is my attention span sometimes. I find myself totally intimidated by print books over about 400 pages long, but since I got my Nook a few years ago, I've started picking up the longer books on that so that A. I can't see how big they are, B. I can read them in bed without feeling like I'm going to be crushed and C. so that it's harder to tell how much is left... I'm much more successful at finishing the big ones that way!! Before I was a book blogger, I would sometimes choose books just based on their size. I felt the bigger the book, the better, because then I'd get to spend so much time with the world and characters. Now that I blog, I am definitely more hesitant to pick up a big book just because there are so many I want to read that I feel guilty spending too much time in one story. Plus I can't read more than one book at once, so I know I'll be stuck reading this one that will back up my reviews and ughhh. Lame! I totally think it's easier reading a huge book on my Kindle! I read game of thrones on my Kindle and it didn't feel quite as long as the 1000 pgs it is. I think like anything is depends on the book. If it's something you're enjoying, you don't want it to ever end. But if it's a bit of a struggle then a large book can turn into a gargantuan task. The only really long books I've managed to get through quickly and painlessly were Connie Willis'. I've read several by here, and they are all long and dense but reading them never felt that way. Otherwise, I tend to read anything but I do get a bit put off when something's really long, just because I know it'll take longer than I want it to. I bought a kindle specifically because of this - I'd stopped reading as many longer books because I was getting intimidated by the time commitment somehow. Now I'm on the 5th book in A Song of Ice and Fire and I absolutely love my kindle for helping me get through longer books. It also means I don't have to keep a smaller volume on hand for when I need a book to throw in my purse for the train ride - I can keep reading the same thing, because my kindle is so small. I love reading and writing doorstoppers, and wish they were more popular these days. I write and read historical, so it seems most natural for books to be at least 500 pages, often over 1,000. I like to climb into a massive, sweeping saga and live in it for a few weeks, not breeze through some 200-page book in a few hours. Most people probably wouldn't believe me if I told them I read War and Peace in only 19 days, and was kind of disappointed it took that long, instead of two weeks maximum.